Wear better. Look better. Feel better. At Body Intelligence, we are passionate about making you look and feel your best all day, every day. 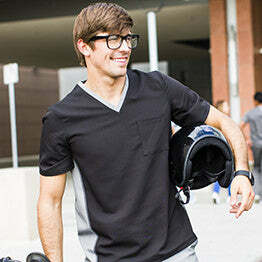 Unlike other scrubs, Body Intelligence scrubs are technically engineered for premium performance. Each piece features high tech stretch fabrics that enhance mobility, allow your skin to breathe and help regulate your body temperature as you move through the day. The workday moves quickly, so it’s time to invest in active scrubs for medical professionals that have been designed to maintain comfort, efficiency, and a professional appearance all day long. Our lightweight and breathable scrubs are meticulously tailored to adapt to the natural contours of your body, reinforce your professional image, and highlight your best features with a proper fit. Shape Enhancing pockets where you want them. We combine technically superior, environmentally safe, lightweight and breathable scrub fabrics with ergonomic waistbands and precision styling to create an intelligent uniform for every body type. Body Intelligence active scrubs for medical professionals retain their shape, resist wear and maintain a polished wrinkle-free appearance, wash after wash.